We had lots of fun last Friday - another Floggers get-together. This time, it was a big big party for Christmas at My Elephant by Doodee at Section 17, Petaling Jaya. I was late hence by the time I got there, all I had was bits and pieces of food served. I didn't get to mingle much too (very sorry people!) as I was sitting at the non food blogger's table plus when I started mingling, I realised I kinda lost my voice with all the shouting I had to do to be heard. Sigh! Apologies to those who were there, whom I didn't meet. Special thanks to Lyrical Lemongrass, Precious Pea and WMW who organised the coolest party ever. Do visit their blogs for the blow by blow accounts. Back to food glorious food. 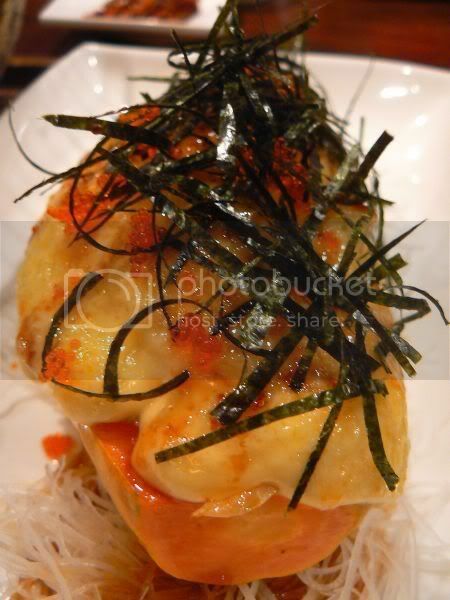 When it comes to Japanese food, if I don't get my regular dose, I get withdrawal symptoms. Hence I was ecstatic, when I finally did get to eat some, even though it was revisiting Kampachi. I got a bit too over enthusiastic, when it came to ordering, hence the huge spread of food for just two of us. Since I didn't get to try their soba in my first visit, it was a must-have this visit. Thumbs up to the handmade soba noodles. Made daily at Kampachi from buckwheat flour, these noodles were so good, I could just sit and slurp bowls and bowls of it. Unlike the soba noodles we get in packets, fresh ones are softer. 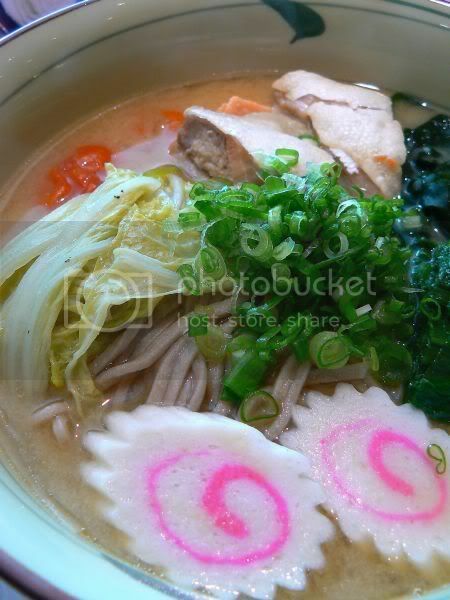 These noodles in Kampachi are not round but have a squarish look to them probably due to the cutter they use. The broth served with the noodles was very good too - sweet and tasty. The Ishikari Soba, I ordered was served with pieces of salmon, wakame (seaweed), spinach, two pieces of pink and white kamaboko (fishcake), chinese cabbage, shredded spring onions and two cherry tomatoes. If you fall in love with the soba noodles, they even sell them by the packet(RM26) to take home. We went a bit maki crazy. 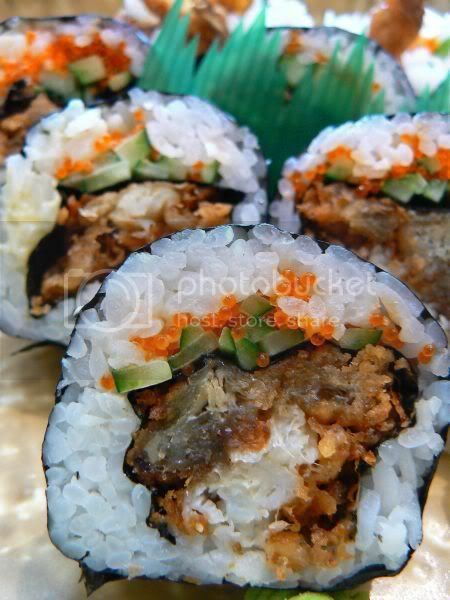 First, it was the soft shell crab maki (soft kani maki). 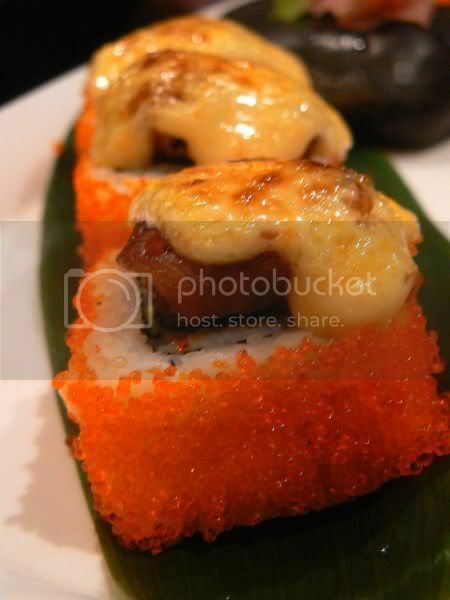 Thumbs up to the super crunchy soft shell crab they used in the roll. 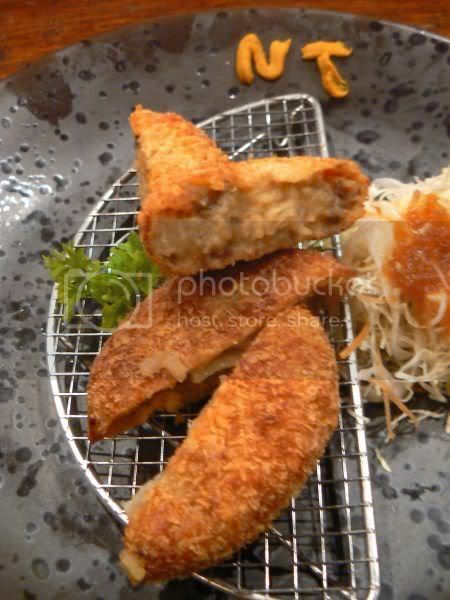 Usually, the makis I have tried, the deep fried soft shell crab is soft, when served. 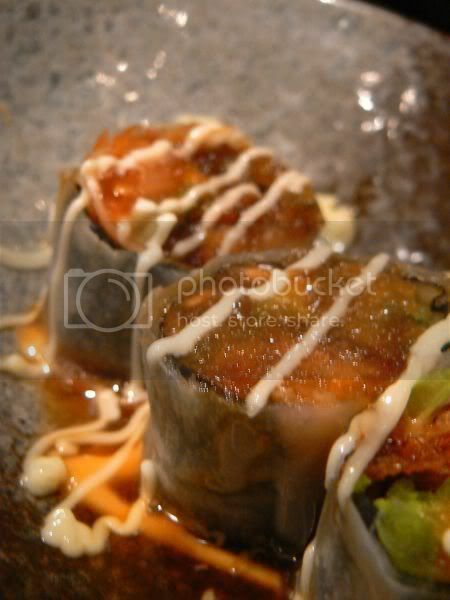 At Kampachi, their version does not soften as they don't use so much mayonnaise in the maki. 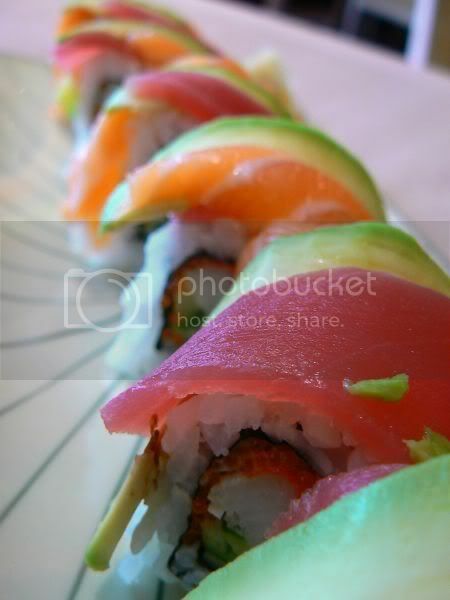 However, as a compromise to crunchy crab, the maki tends to be quite dry. 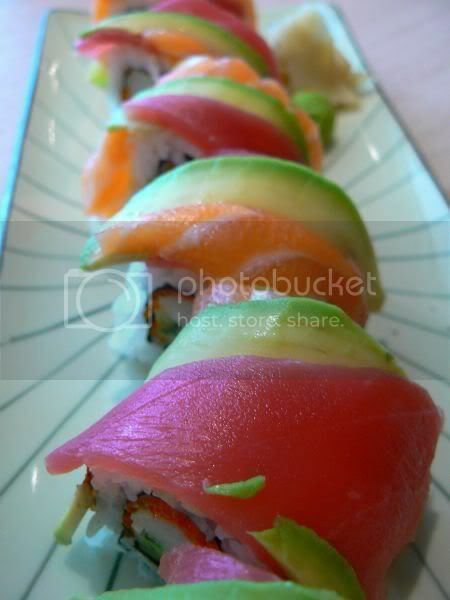 I also ordered the Rainbow Maki, their recommended maki. It came topped with avocado, salmon and tuna slices. Unfortunately, they didn't get this one right - avocado slices were not ripe enough hence no buttery taste. Sigh! Last but not least, I had a special order of pan fried mushrooms. 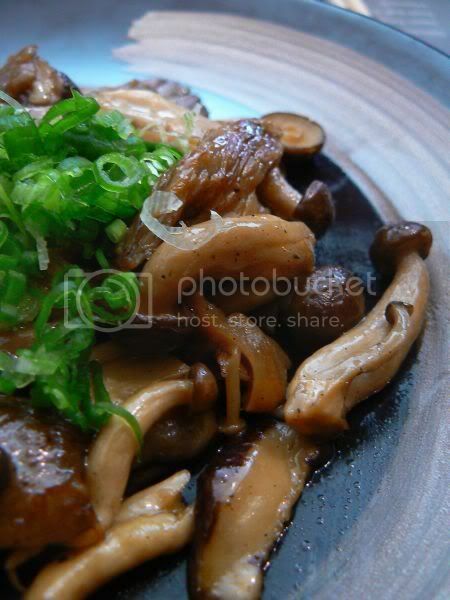 I love this mix of mushrooms (enoki, shitake and honshimeji) fried with butter and soy sauce. Add a dash of shichimi (Japanese chili pepper), if you like a bit of kick to the dish. Merry Christmas everyone! Am sure all of you are busy with celebrations. Sorry but I have no food pictures from this year's Christmas party. Stupid me, I forgot my camera last night. I was charging my battery and with the rush of picking my mother from the airport, getting her settled at home and etc, I forgot to take it with me. We had a great time - turkey and yummy lamb cutlets from Shangri-la Hotel, fried beehoon, home made pie tee (I had loads courtesy of Splashie Boy), Johor Laksa and etc. Dessert was yummy pavlova topped with decadent thick cream mixed with my absolute favourite, clotted cream from Devon. 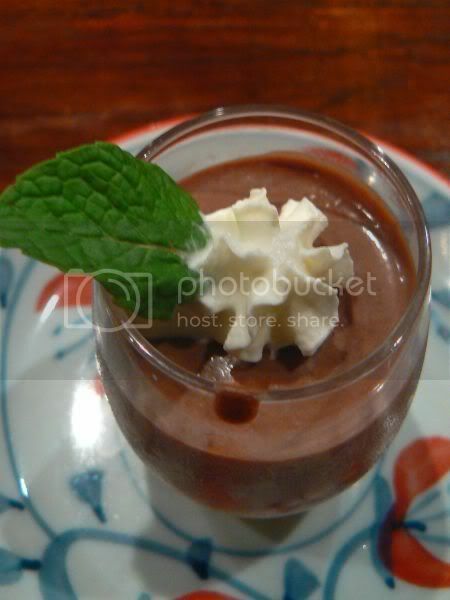 Made by my friend, Ms. P, she has now perfected Nigella Lawson's recipe. Back to day to day food, today's post is about a favourite place of mine - the Petaling Jaya Old Town Gluttons Square. I often hang out at this place for their yummy Ais Kacang, now I discovered another great stall. Introduced by my mother, this stall sells fried noodles, rice dishes. 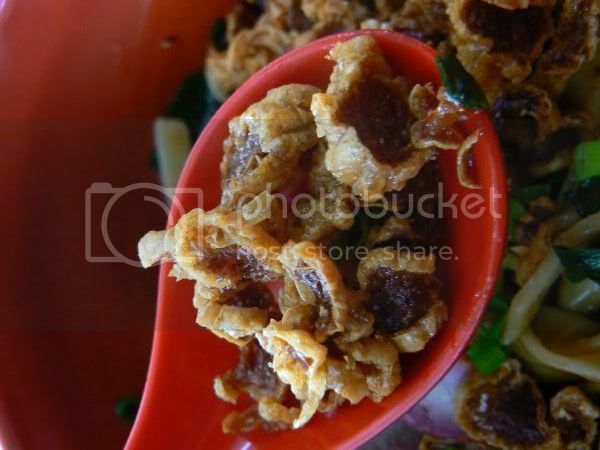 We especially love their fried beehoon mixed with bits of salted fish. Portions are generous especially the prawns for about RM5. 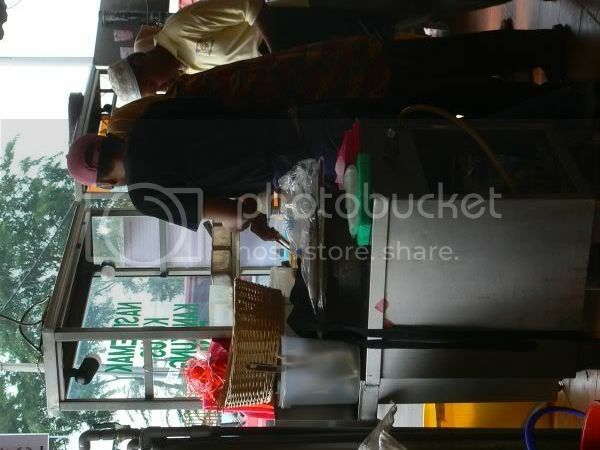 The stall is run by a young couple - the wife is behind the wok while the husband handles the orders. I love the generous portions given plus the fried beehoon has lots of "wok hei". Only gripe about the noodles is the pork slices - quite dry, which is expected since lean meat is used. 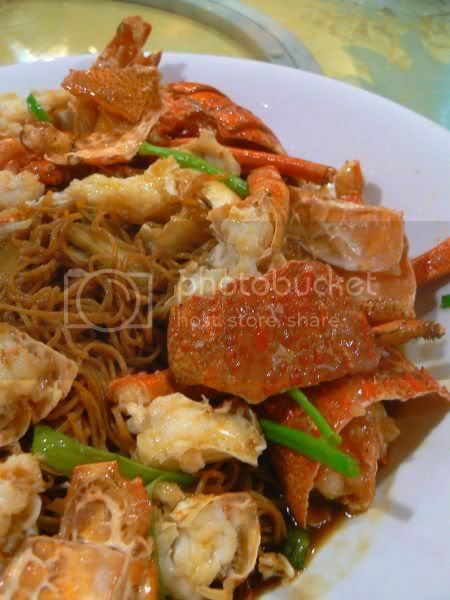 Their cantonese fried noodles is also quite popular especially during lunch time. To cater for those one the go, they also serve one plate rice dishes - roast pork fried with celery or salted fish with belly pork. I love these teeny weeny bites. Oozing with sinful durian cream, one bite is never enough. Luckily the shop seems to know it, as they sell them in packs of 4 pieces for 60 sens each (RM2.40 per pack). Encased in a plastic sandwich box, everyone loves these puffs. 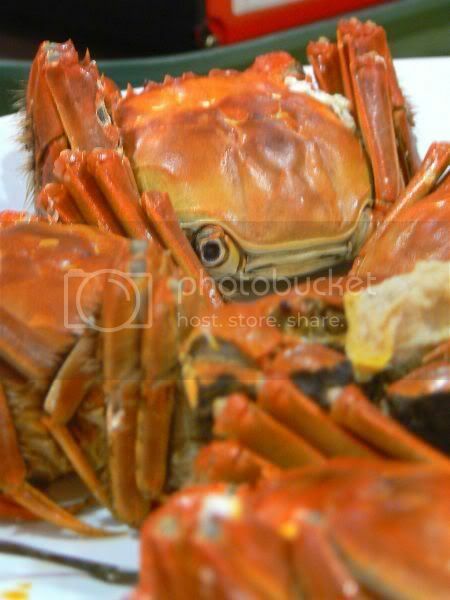 I once brought them to a King Crab dinner and the guys - tankiasu, Jackson and Jason gave their thumbs up. 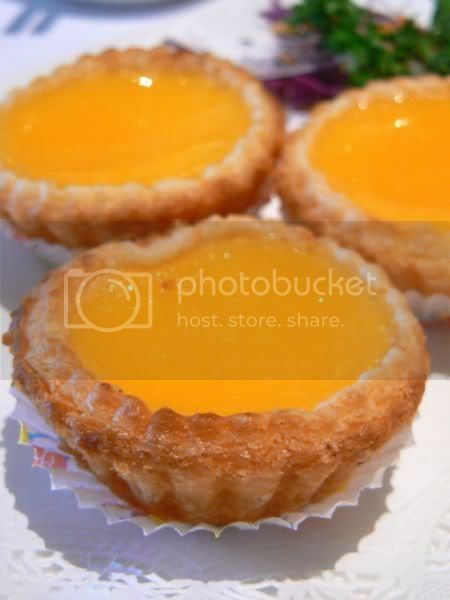 The bakery also sells various pastries - egg tarts, durian tarts, durian swiss roll, pineapple tarts, sandwiches and etc. Getting here is okay if you take the LRT but if you're driving past to just pack a few, there's no parking around this busy corner. 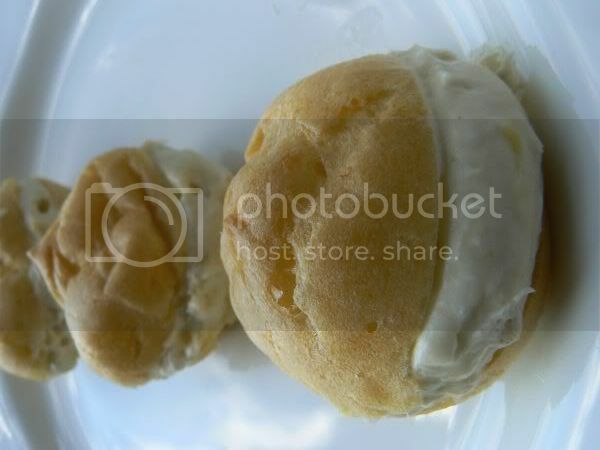 They also supply these durian cream puffs to a certain cafe in Pavilion Kuala Lumpur. However prices are like double or triple, if I am not mistaken. Definitely better to get them here. 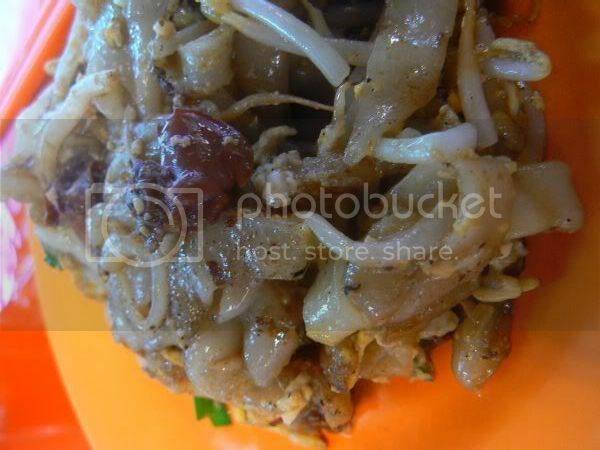 There has been a lot of write up with regards to this famous Char Kuey Teow. A recent one at the NST prompted me to go search for it and I discovered all the stalls, which were at Restoran Subang Ria has shifted to Restoran Jamal Mohamed, the corner shop right at the other end. Rumours are flitting the reason why they moved is because the owner wanted to open his own stores. I guess you can't fool the locals as this place is now packed while the other restaurant is basically "catching flies". Being a first timer, I was skeptical when the plate of char kuey teow arrived on my table. It looked pale and a bit unappetizing. A bite of a strand of the fried flat noodles and I went WOW! Looks are definitely deceiving as it had lots of wok hei aka breath of the wok and most importantly, it tasted good. It doesn't look much but it definitely packs a punch. 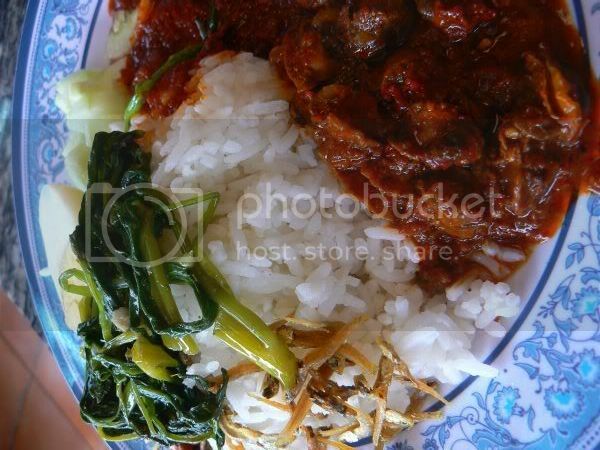 My next visit to this restaurant during the weekend, I saw lots of people having this nasi lemak hence I ordered it. 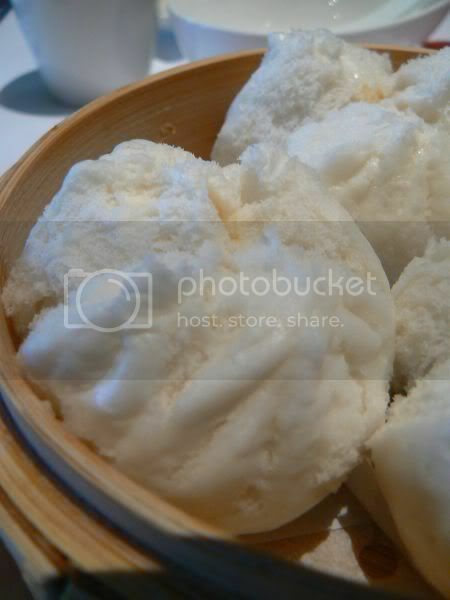 I can understand why it was so popular - the steamed coconut rice was fragrant and came in fluffy seperate grains. A selection of items are available as accompaniements to your basic nasi lemak - chicken rendang, sambal kerang (like mine above), sambal sotong, paru and etc. You have a choice between half a hard boiled egg or fried egg. 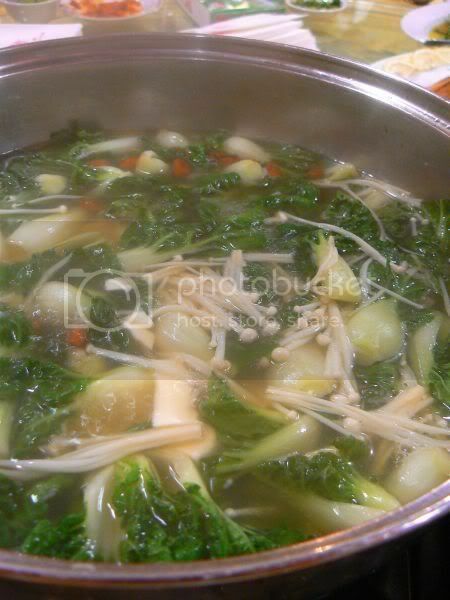 I really liked the kangkung - water spinach since I am not a fan of cucumbers. Although the food is pretty good overall, I felt the sambal didn't have the spicy kick. However, it is perfect for those with milder taste buds. Give a try during the morning, I kinda prefer this to Nasi Lemak Cikgu in terms of sambal and the rice. However, Nasi Lemak Cikgu does have one plus point - their yummy fried chicken, which they are uber famous for. Continuing on the pan mee trail again. This time round, I got to try the famous Bao Bao pan mee. An established name in town, they have branches in Puchong and Pandan Indah. The set up within the shop is simple - square wooden tables and chairs, with an open cooking space at the end of it. 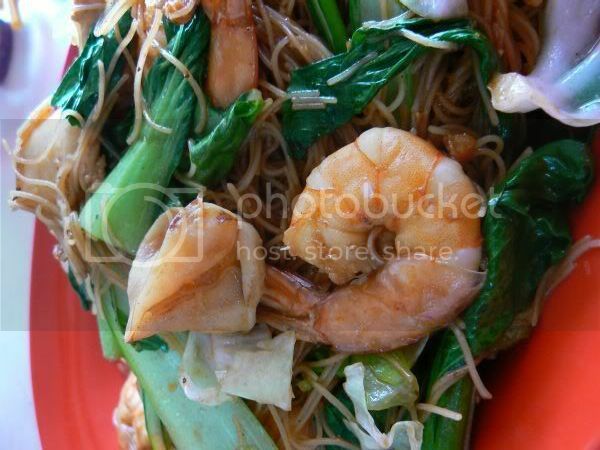 You can order a variety of noodles - thin, thick or even hand pinched. What makes their pan mee unique vs the rest of the others - a generous sprinkling of these fried crunchy items. 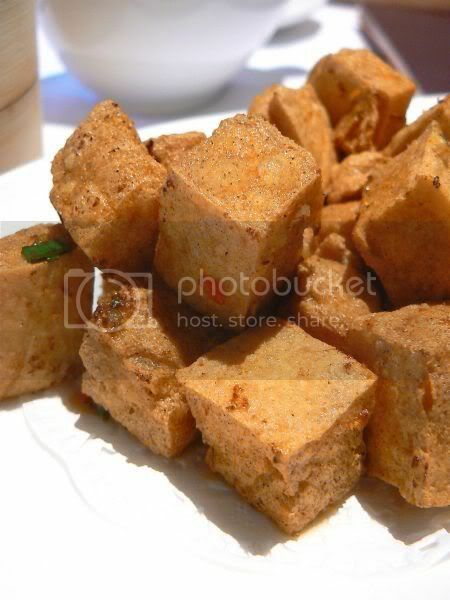 These crunchy bits are actually shredded stuffed bean curd skin with fish paste. 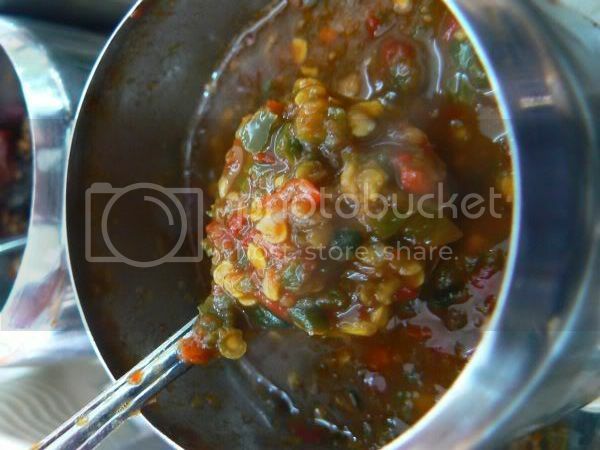 A must for pan mee lovers - chilies! 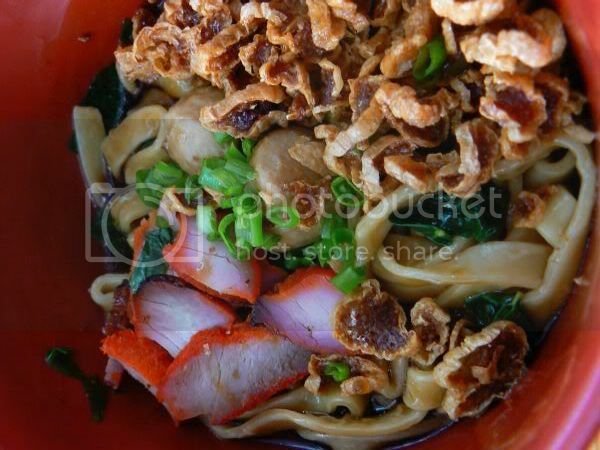 They go all out to please those who love their sauces - a platter of 4 types is given to you with your order of pan mee. Take your pick from red and green chilies mixed with a tamarind and calamansi lime juice, sambal belacan, chopped bird eye chilies and etc. Soy sauce is also available. If you love their sauces, they also sell them in a bottle at the cashier counter. I quite enjoyed the crunch of the shredded bean curd skin but didn't think much of the taste, probably because there wasn't any! The texture of the pan mee is good - al dente, just like how I like it. 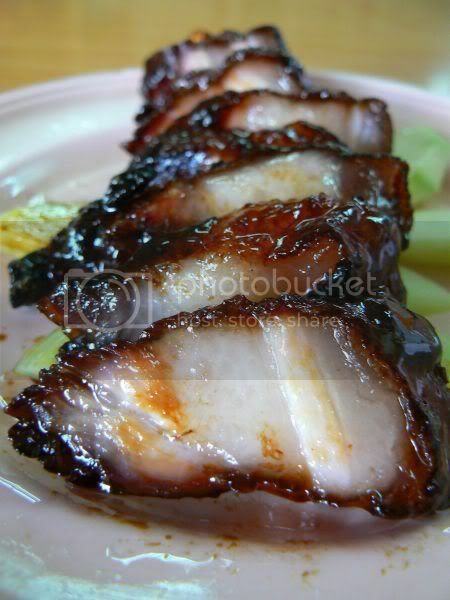 What I really hated was the dry thin and "red colouring" char siu slices, they topped the dry pan mee. Overall, not a bad experience but wouldn't say a fantastic one either. This is definitely a place I will go eat if I have no choice but if I had to drive all the way to eat pan mee, it would still be places like Kin Kin or Taman Sri Sentosa. I first heard about this stall when I read Loopy Meals' dedication to the wonders of this smooth chee cheong fun. As usual, my urge to try this was shelved as it meant me waking up early in the morning. After two years of hankering for this chee cheong fun, I was reminded of it's existence by Lianne. This time round, I made an effort to try this place. Being unfamiliar with Section 14, it took me a while to find the stall. It is easy to find the restaurant which is the only coffeeshop in Section 14 but there are 2 chee cheong fun stalls within the restaurant. First time I went it was a Monday hence I thought I had picked the right place. 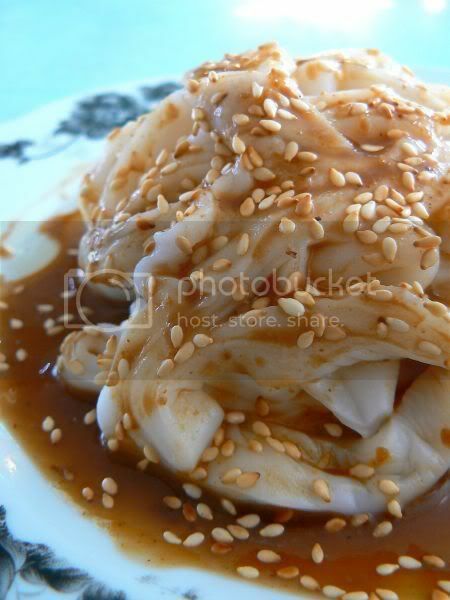 I tasted the chee cheong fun and thought, "Weird, this didn't taste special." My second visit, I finally found this stall. This one looked genuine as he had loads of pickled green chilies which Loopy Meals loved. The old man which Lianne mentioned was there, busy filling up orders for the morning. 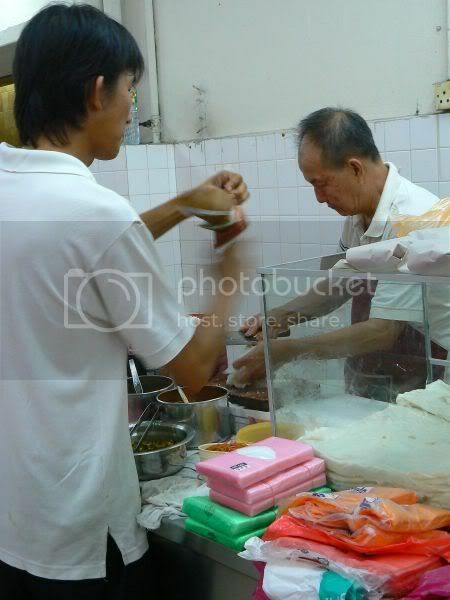 Helped by a young man, the stall is quite simple with a transparent plastic case holding the cooked chee cheong fun. 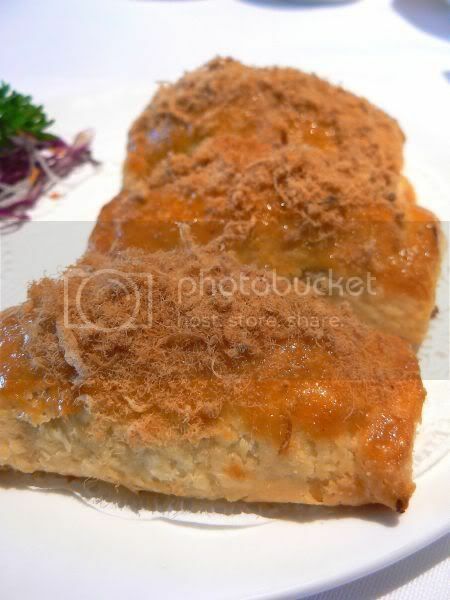 As and when the order is placed, he chops the chee cheong fun and ladles the sauce over. I love sesame seeds hence I asked for loads. Yummy stuff! I really liked it but the sauce didn't taste like it had prawn paste, just the ordinary "sweet sauce". You can order various sizes - extra big (RM2.30), big (RM1.90) and small(RM1.50). 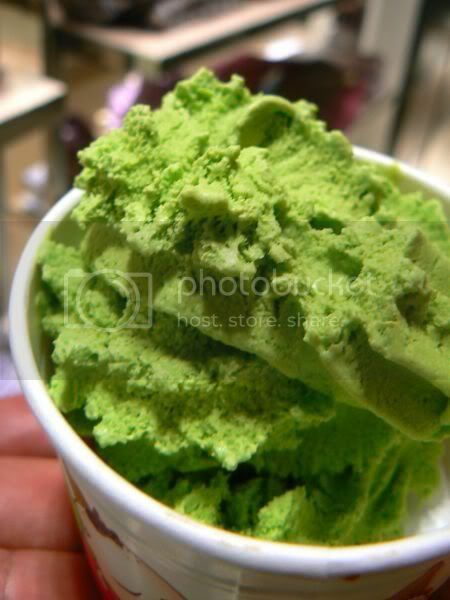 Something short and sweet to end the week with - Matcha Ice Cream from Yokomon. I saw this particular Japanese brand of ice-cream during the recent FHM event in KL Convention Centre. They have started selling this here at the Curve's concourse area as a special Xmas promotion. It seems their outlet is at Cathay Cineleisure. I felt it was quite pricey for about RM6.90. However, it is interesting to see how the machine works. Frozen ice cream in a small round tub is taken out and placed in this machine. The staff will wind this lever at the side and the ice-cream will come out in a soft swirl. I guess there is a mechanism within the machine to convert the frozen ice-cream into a softer version. The texture is nice but I felt the matcha taste was not so strong. Must be my own personal taste as I like my matcha tea to taste quite strong and slightly bitter. Aside from matcha, they also have azuki (red bean), goma (black sesame), daku choko (dark choc), ichigo (strawberry) and ramu reezun (rum raisin). Tis the season to be jolly.....! I found out last week that Delicious has a Christmas catalogue with all their goodies for the festive season. Laid out in a manner which looked suspiciously like my Donna Hay or Marie Claire cookbooks, there are recipes and pictures of items you can order to cater for your party - roast turkey with all the sides, cakes, cupcakes and etc. I also found out they were serving their Christmas special - Roast Beef with Yorkshire Pudding. During my years in England, I developed a love for roast lunches. I used to look forward to Sunday lunches where it was traditional to have roast beef, lamb, pork or chicken. Served with lots of brown gravy, it was a perfect end to a week. The one in Delicious took a while to arrive on the table - could be due to the time it needed in the oven to reheat. I asked for medium and the roast beef slices was good and tender. Instead of the brown sauce gravy they served a black pepper sauce on the side. Wasn't my favourite as I still prefer traditional brown sauce hence I dipped my beef sparingly. Although I liked my roast beef slices, I didn't quite like the sides. Yorkshire pudding was okay and a large portion. They served brussel sprouts and chesnuts topped with almonds, a favourite of mine. Unfortunately they had chucked it in the oven to reheat hence it was quite dry. 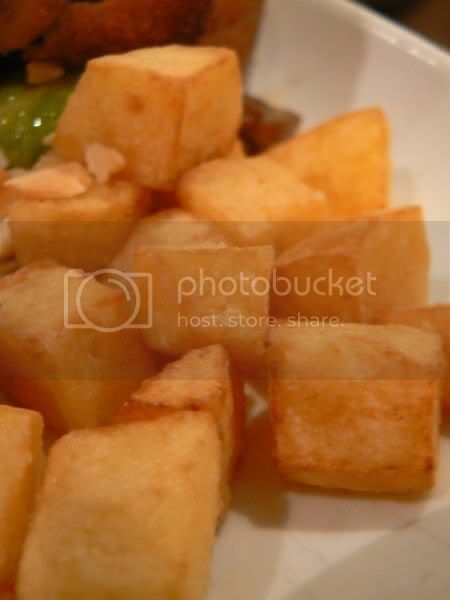 I also had roast potato cubes on the side which was not bad but not crunchy enough. Priced at RM49.90, I thought it was a pretty good deal as the portion was huge. For the sides, I guess I have been spoiled by my friend Mau's excellent cooking as her brussel sprouts and chesnuts is still the best ever. 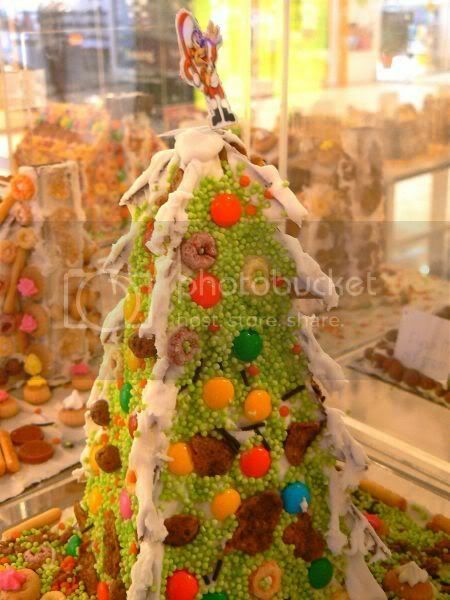 I thought I'll also share you pictures of this cute gingerbread house and Xmas tree I found at Bangsar Village. They must have had a kids decorating competition for Xmas as they had a few of houses and trees all nicely decorated on the first floor. 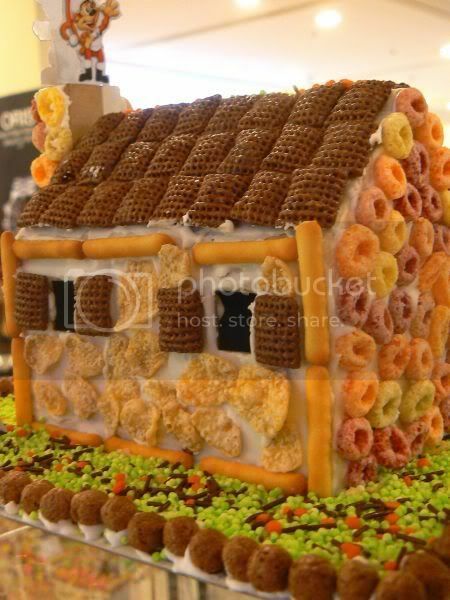 I liked the design of the gingerbread house but the kid did forget one important detail as there were no doors to the house! Sigh! What a weekend I had. Anyway, I'm not a person to dwell on the past so let's look forward to the week. I reckon the best way to start off a week is with something really sinful and this definitely is a winner in that category - Soo Kee Char Siu. Although this place is not opened tomorrow but I guess you can all plan for this for lunch on Tuesday since it is a public holiday in Selangor. This was a new discovery for me even though this place has been around for almost nineteen years. Located just off Jalan Ampang, the shop's frontage is limited with the flyover right next to it. To keep off the dust from the busy highway, the place is air-conditioned with glass sliding doors. You can see all the delectable char siu from the front of the shop where they hang all the barbequed meats - roast pork, roast duck, chicken and etc. Although the char siu here is a bit fatter than what I normally prefer, I really liked the sticky caramelised outer layer. However, be warned that the char siu here isn't cheap as a small portion can cost approximately RM10. 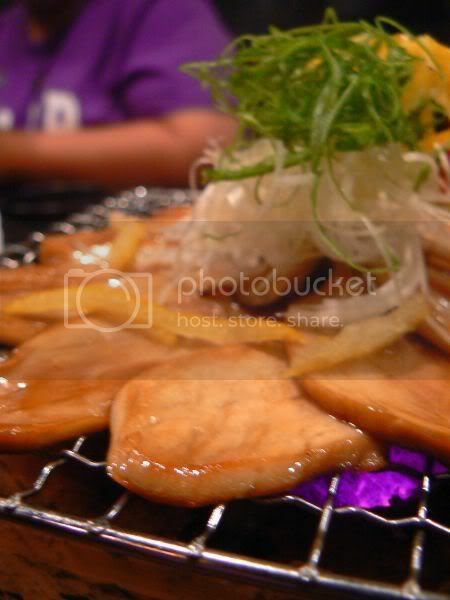 Aside from the barbequed meats, they also serve cooked dishes like vegetables and steamed fish which they are also famous for. I quite like their daily soup which goes well with the char siu and white rice. I know the picture above is kinda blurry but sadly those are the few images I have of Fatso, the kitten who passed away yesterday. Ever since the kittens grew up, we decided to let them out of the cage to run around to stretch their legs. They get into crazy antics jumping around and somehow Fatso ended up in the neighbour's house. Poor fella, he just froze there and didn't know what to do to get out. Unfortunately the neighbour's Rottweiller found him before we could rescue him hence he lost his life. I was really upset when that happened since I had vowed to keep the kittens safe. Felt really helpless we couldn't help him escape. 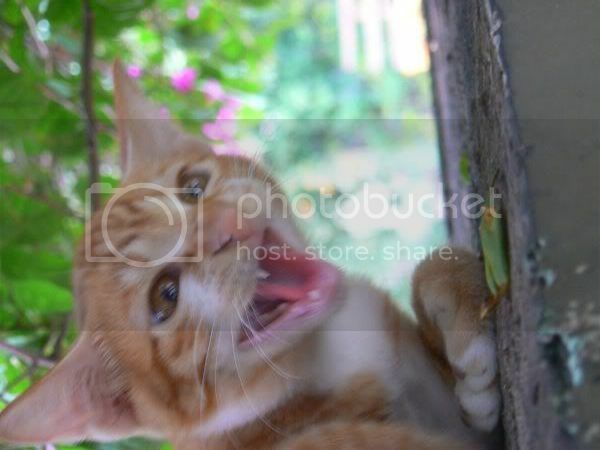 That day was made worst as I reckon the next door neighbour had abandoned her kitties since she shifted house. Weird how some people are so heartless to leave their pets and run off somewhere else. We have been feeding them for quite some time since they cross the road and come mewing for food from us. Unfortunately one of the kittens (there's 3 kittens and a mummy cat) had an accident last night as a car ran it down. This was late at night but by then I was convinced that was definitely the worst Friday ever. Whatever happens now, I get paranoid about the kittens and hope they will be okay. I also hope Fatso and the kitten is happy in kitty heaven where all kitty wishes come true whether it is yummy food and lots of things to chase. Rest in peace kitties! Upsie from What Did You Eat? is hosting this WCB. Do drop by and say high to sweet Upsie and all the other kitties. Hear ye! Hear ye! The first meeting of the Japanese Friends Kawan Association (JFKA) is called to order. Topmost on the agenda was great Japanese food which we found at Ninja Jones. It was a momentous gathering when great appetites get together. Not only did we get things in order with the association, we also celebrated Precious Pea's birthday. Feeling tired after jamming my foot on the accelerator and brakes since it was the eternal jam on the Federal Highway, I left it to the president of JFKA, the honourable Madam Lyrical Lemongrass to order loads of food to feed our grumbling tummies. The manager was a real sweetie as he guided us through the menu with recommendations on house specialties. I reckon nowadays I get so tired my picture taking skills has detiorated tremendously. Takes me longer to get a perfect shot and I will get days or nights when out of all my snaps, one will be blurry. Once we ordered, food started arriving quickly on our table. As usual, when Floggers get together, food tends to get cold since each dish goes through the "food paparazzi" with all sorts of cameras zooming on the food. We almost had a mishap with the Eriningi Grill as the mushrooms started to burn slightly. Luckily we rescued them from the fire and everything was still good. Thumbs up to the juicy mushrooms! 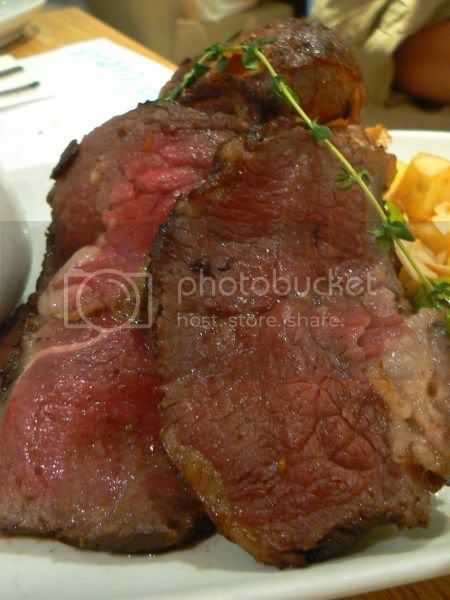 Since it was a dual celebration, we went for the jugular - the Kobe Beef which costed a whopping RM195++. Didn't feel so painful since we ended up sharing the bill and it was very worth it since it was excellent - the melt in the mouth and juicy texture. Maki orders were made with the consultation of Head of Maki, Paprika. She deemed the two varieties we ordered good stuff. The Avocado and Soft Shell Crab Namaharu was interesting with its soft texture and slightly tangy sauce. The Volcano Roll which was recommended was such delicious stuff that even the non-fish eater aka WMW enjoyed it. We kinda suspect she likes the cheese topping the unagi that masked any fishy smells which she hates. Similar to the Honeydew Moto Yaki version I had at Yuzu, their sister company, this dish was served on top of a halve of papaya. Although the creamy sauce was yummy I think I prefer the honeydew version more. Aside from traditional Japanese food, Ninja Jones also serves a variety known as "Jones Cuisine" which is basically Yoshouku or Western food given a Japanese twist. Here the traditional Nikujaga - the homey beef stew with potatoes get re-invented as a potato croquette. I thought this was pretty average tasting. 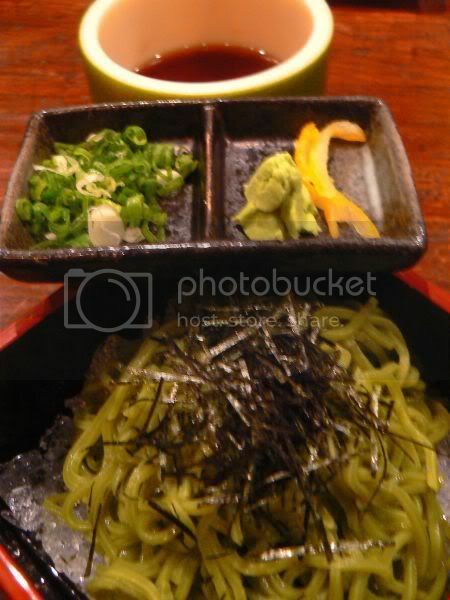 To share, we also ordered tummy fillers like Garlic Fried Rice and Cold Cha Soba Noodles. I thought the Garlic Fried Rice was pretty good. Also loved the cold taste of the green noodles dipped in soy sauce. To end the occasion, we had complimentary Chocolate Mousse and the celebration cake - Chocolate Brandy Truffle Cake from Fatboybakes. 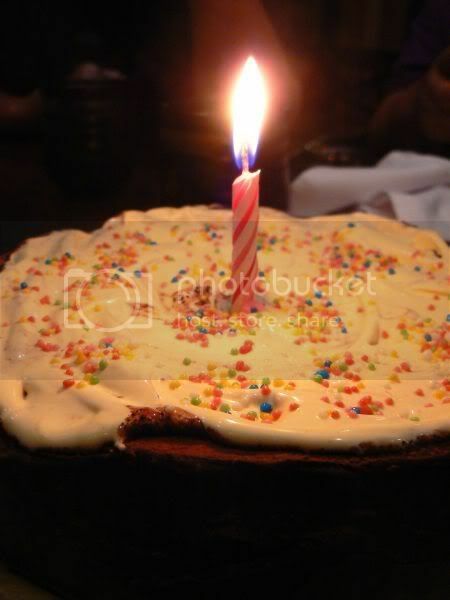 The people at the restaurant were so innovative as they decorated the cake for us with pure cream and a sprinkling of hundreds and thousands. Good stuff (Hic!) which had our Madam President ranting on about something.....Honestly I was too (Hic!) to bother on what she was going on about. Maybe it was about the next meeting. Whatever it is, I will definitely vote for once a month gatherings to enjoy yummy Japanese food. When it comes to Crystal Jade's restaurants, my whole family are great fans. They regularly dine at the Singapore and China outlets till they have their favourites. Recently, with the opening of the two new malls, The Gardens and Pavilion, Crystal Jade has been expanding. To add to their existing outlets - Crystal Jade Lai Mian at Lot 10 and C-Jade Express in Mid Valley Megamall, they now have Crystal Jade Kitchen and C Jade Meal Cube at Pavilion and Crystal Jade Restaurant at the Gardens. Each new outlet has slight variations - the Crystal Jade Meal Cube is said to serve Western food while the Crystal Jade Kitchen serves dim sum, noodles and porridge. For the Gardens, the Crystal Jade Restaurant is quite posh with dark grey slate walls, aquariums full of live seafood and a row of tiny red terracotta warriors in glass cases. Since we were at the Gardens last weekend for some shopping, we dropped by for lunch. My mother who is the regular at Crystal Jade did the ordering of old favourites. 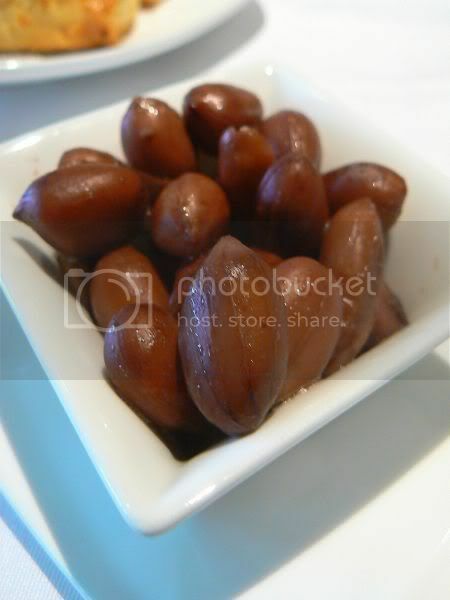 I just attacked the plate of braised peanuts on the table. First to arrive on the table was the Char Siu Sou or BBQ Pork Pastry. My mother panicked when she saw the plate as it didn't look anything like her usual fare in Singapore with the sprinkling of pork floss. After checking with the waiter, it turns out that this was how they served it in Kuala Lumpur. Tastewise, it wasn't the same as Singapore according to my mother, the expert as the char siu filling was quite lacking in taste. I loved the flaky pastry which had a lovely melt in the mouth texture. We fared better with the steamed version. 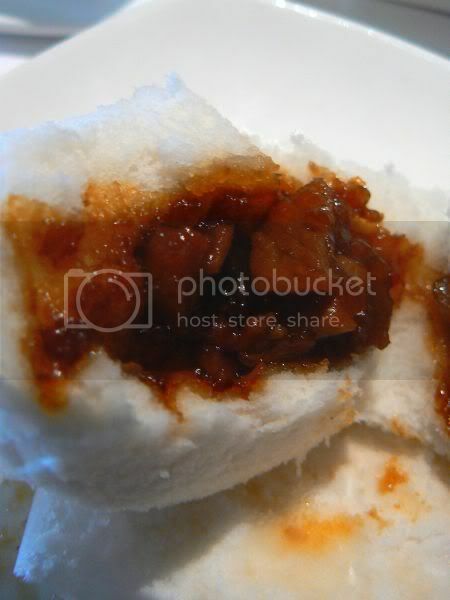 Soft and fluffy, I really liked the char siu bao and this time the filling was so much better. My mother gave her thumbs up to this version. 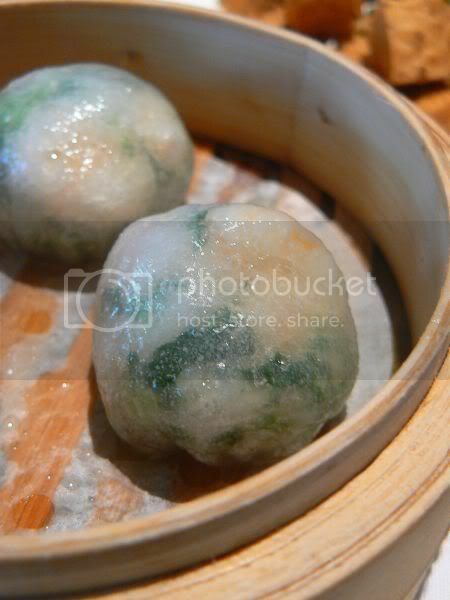 We also had the Steamed Spinach and Garlic dumpling which was covered with a translucent skin. Inside it was a prawn mixed with spinach. I thought the taste was quite bland. 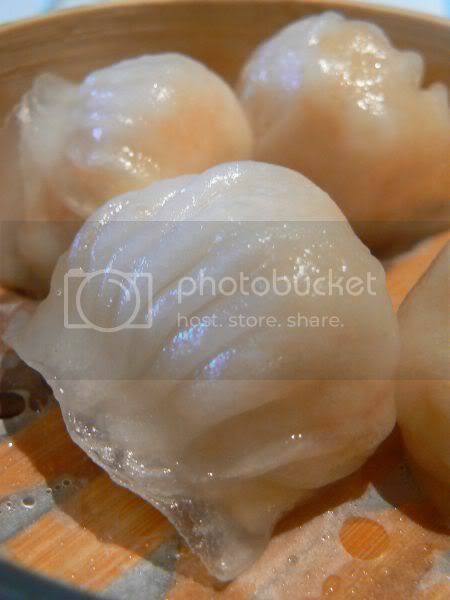 We also tried the classic Ha Kau - steamed prawn dumpling. I quite liked the thin skin which didn't stick to my teeth like the other places I had tried before. The dumpling was also filled with other items like ginger shreds to give it more flavour. Aside from dim sum items (ranging from RM6.50 to RM13), they also had entrees like the deep fried diced bean curd. I quite liked the tiny cubes which had a soft centre and a crispy exterior. 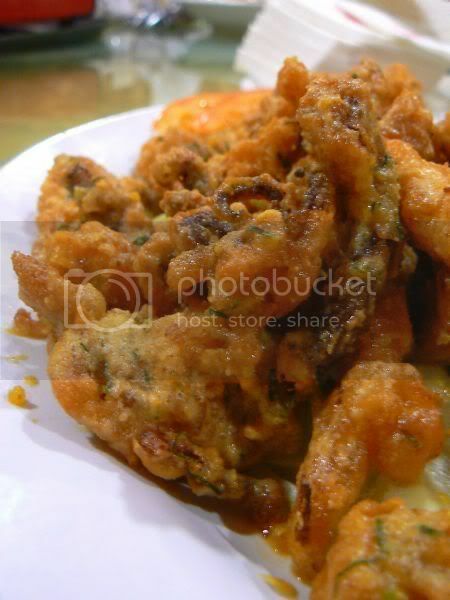 However it didn't have any taste of salted egg yolk, salt and pepper which is what it is said to be fried in. 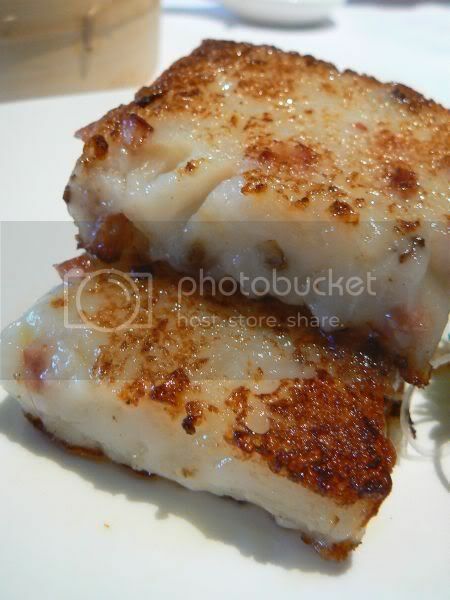 I really liked the pan fried carrot cake which came filled with bits of Chinese ham.Very soft and full of oomph from the flavours of the ham. Only complaint was the carrot cake was a tad too oily. Last but not least, we had dessert. It was a choice between glutinous rice ball with black sesame paste and egg tarts. I liked the flaky crust of the egg tart but somehow the egg custard within wasn't cooked enough. We suspect it would be cooked till a wobbly perfection if they had taken it out from the oven a bit earlier and let it cool down. The bright yellow of the egg custard also was daunting and seemed to signify lots of artificial flavourings. Overall, I would say the food has some hits and misses. 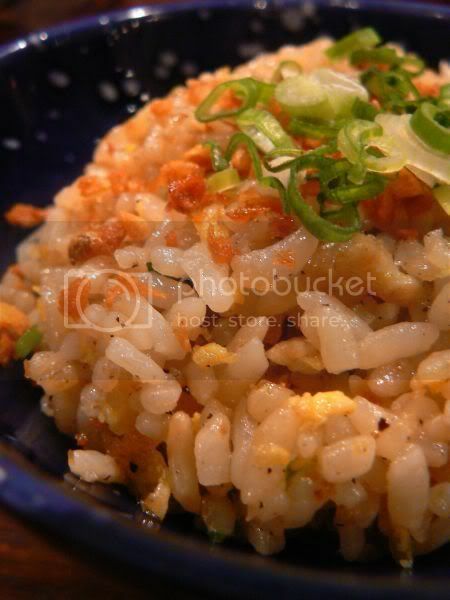 Wouldn't mind returning to try the other menu items like their cooked food (seafood), claypot rice and stone pot rice. They also have congee, noodles and lai mian at this outlet. Meet Hairy! I met him for the first time last Friday. A jet setter, he flies in from China every week. A real popular dude, he gets swamped with fans especially during the months from October to January. I met two cousins that day - one from Tai Woo Lake (RM78++ per crab) and the other from the famous Yang Cheng Lake (RM88++ per crab). The fella from Yang Cheng Lake even came with a tag with a number on it. Seems if you want to check if it originates from that lake, you can sms the number in China and they will reply you. 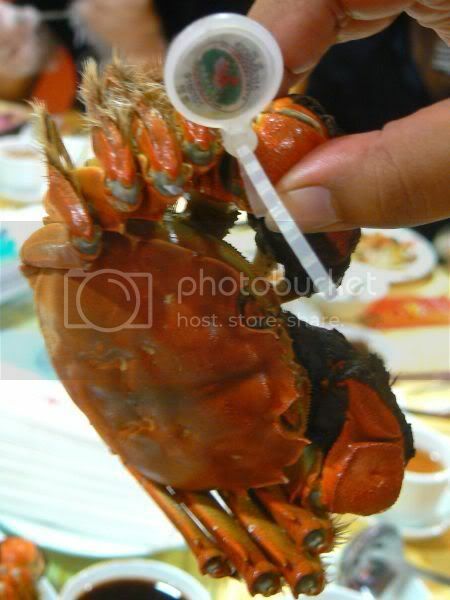 See those hairy arms - that is what distinguishes Hairy from the other crustaceans. There are loads of must dos and don'ts when you meet Hairy but whatever it is, he has a hidden lode of one of the yummiest and oh so heavenly! crab roe under his crabby exterior. The meat is so sweet that you'll end up sitting there savouring every bite. Since I used my fingers instead of the plastic gloves they gave, I could smell the sweet aroma even after I washed my hands. Hairy is such a special fella that one must follow all kinds of rules like, steaming him with Zhisu leaf and ginger to enjoy the sweet meat. 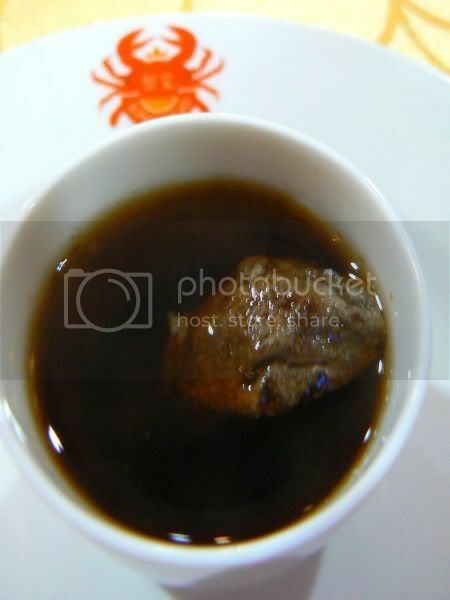 Fa Tiu chinese wine is also a must with Hairy and since he leaves a cooling effect on people, drink warm ginger tea after that to balance back the coolness. 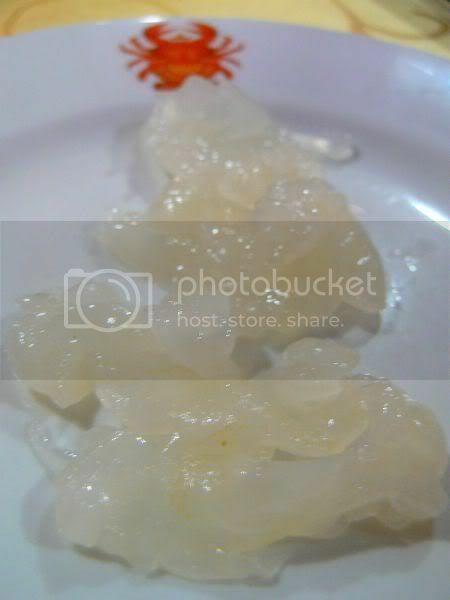 For me the Yang Cheng Lake fella was sweeter and I felt the roe was thicker and richer. Some of my other dining companions felt there was not much difference between the two crabs. To balance out all that cholestrol laden food, we had some vegetables, enoki mushrooms, wolfberries and tofu cubes cooked in a hotpot. It is actually intended for the lobster below but we ended up just eating it alone which was also good as I liked the clear soup. We also had a watercress dish which I didn't snap a picture of it. Dare u to eat me? Do u dare mess with this fella? Poor chap, he came all the way from Australia and we ate him up instead. 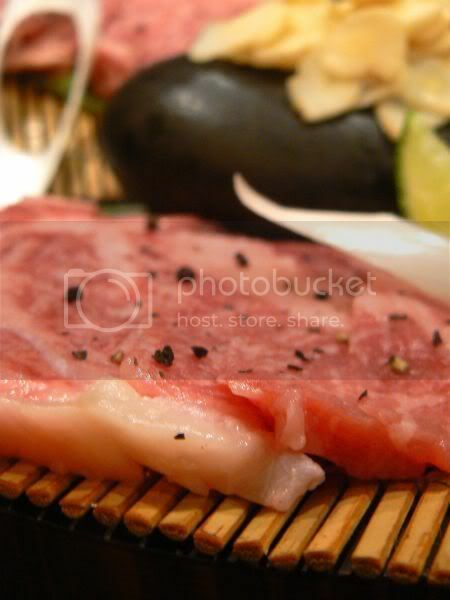 It got sliced up as sashimi (RM447++). Kinda firm tasting, this was eaten with a bit of wasabi and soy sauce. Then the head was chopped up and braised with noodles (RM25++) to give it flavour. Not as strong tasting compared to the Water Prawn Noodles but it was nevertheless pretty good stuff. 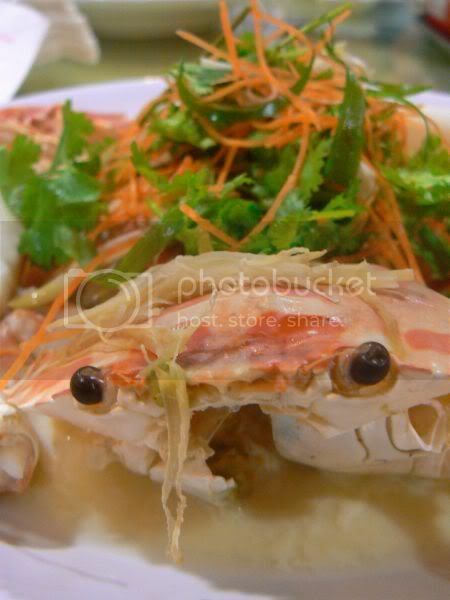 More crabs but this time it is the humble Flower Crab steamed with egg white (RM67.50++). 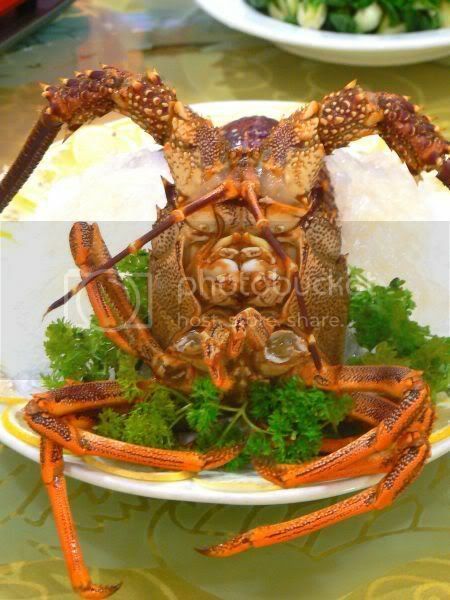 Really good stuff and one of the best flower crabs I have tasted. I liked how the meat came out in chunks which made it so easy to eat. 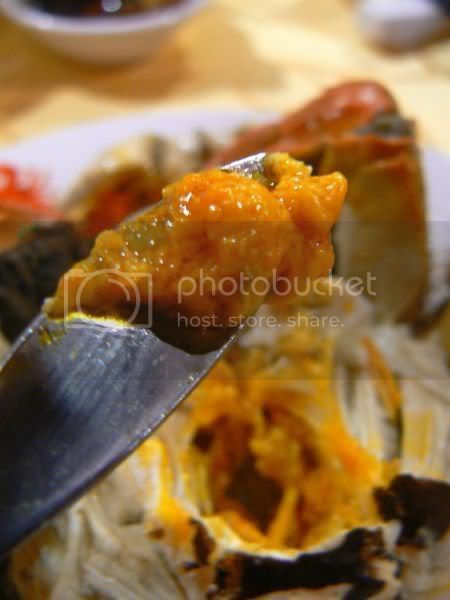 King Crab's must have - Salted Egg Yolk Sotong (RM25++). Really good stuff and it was finished within minutes by all of us. We even had yummy dessert - special Director's Cut Tiramisu topped with juicy black berries, strawberries, cape gooseberries and kiwi fruits. 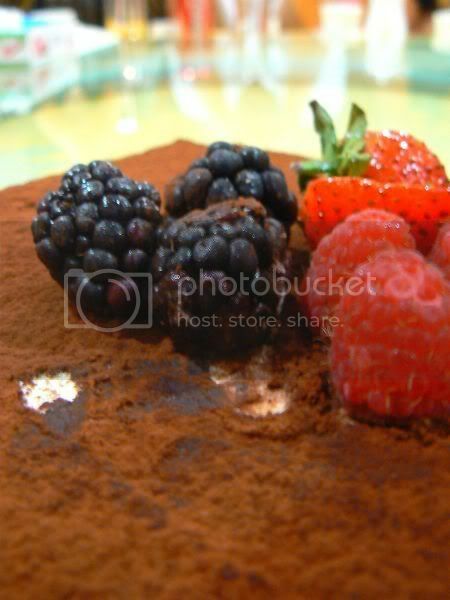 The cake was so nice and light, we all finished it quickly with little effort even though we were full from the meal. It was an extremely satisifying meal even though it did take up almost the whole night and the company was even better! I don't think I will be meeting Hairy this year but I'll definitely look forward to seeing him next year when it is the season.